The County Expressway Plan, as official policy, recognizes that all expressways are in fact arterial roads: "The expressway vision statements all classify the expressways as arterials." [page 88. Each expressway-specific section has a vision statement.] Previously, the County highway engineers, and some city traffic engineers, claimed that expressways are freeways. 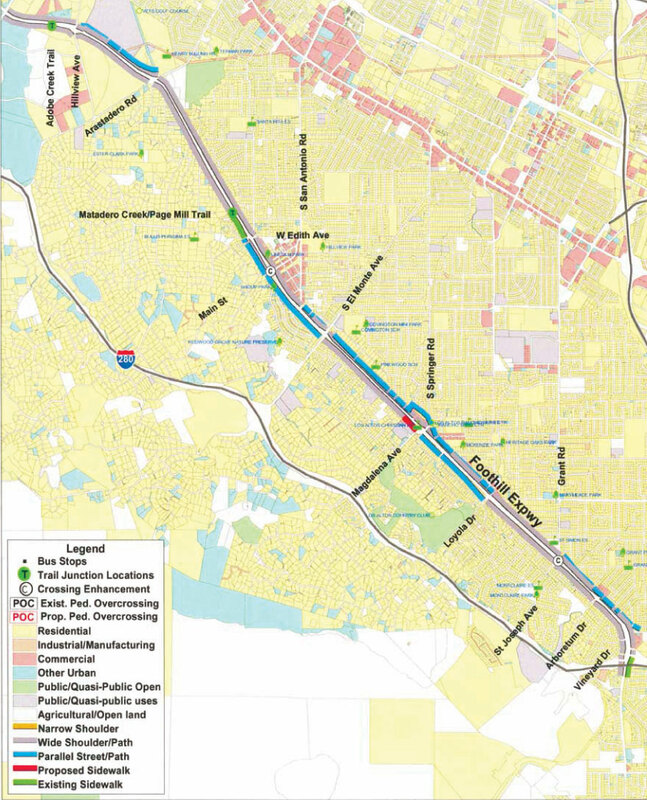 Expressways do meet all the AASHTO specifications for 'arterials' category as shown in the VTA policy. The County Expressway Plan recognizes that expressway shoulders and pedestrian paths are safe for occasional pedestrian use: "shoulder or path facilities can serve ... for occasional pedestrian use." [page 93, copied below]. Previously, County highway engineers claimed that shoulders were "unsafe" for both bicycles and pedestrians, and that unpaved pedestrian paths were "unsafe" for pedestrians, for no other reason than it is cheaper to post "bicycles and pedestrians prohibited" signs than to relocate bicycle/pedestrian facilities in future lane addition projects. FHWA policy states that "Paved shoulders have safety and operational advantages for all road users in addition to providing a place for bicyclists and pedestrians to operate." 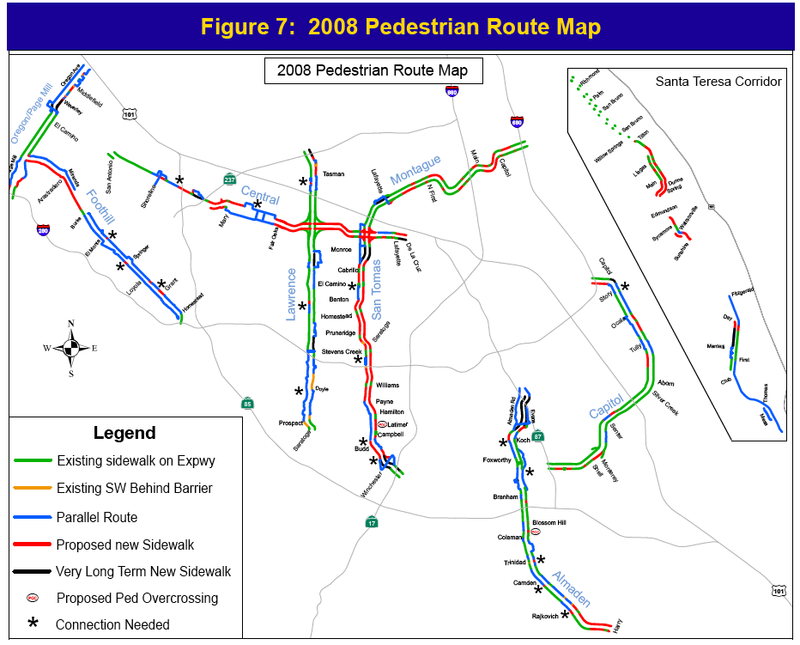 The Santa Clara County Board of Supervisors voted to update the Expressway Plan, on March 3, 2009, to include sidewalks along expressways, usually on both sides of the road, with exceptions if a nearby route is available. Maps were generated and MTS verified the exceptions as being valid. Previously, a typical detour was one mile if the expressway was prohibited (to pedestrians, transit patrons and bicyclists) due to the hierarchical street patterns that force using arterial roads, and because these arterial roads -- which include expressways --- are spaced typically every half a mile. The 2009 Plan superseded all prior policies and the 2003 Plan with regard to pedestrians (while other sections of the 2003 Plan remain valid). The current policy (in the 2009 Plan) neither explicitly supports nor opposes pedestrians on shoulders and pedestrian paths. This map is page 90 of the 2003 County Expressway Plan (main section). For higher resolution maps, see expressway-specific sections. A deficiency of all the 2003 maps is that where there are two traits along an expressway (as described in the legend), it would only show one trait on each side of the road, instead of showing two colors of the two traits. For example, where there are existing wide shoulders (grey) AND future planned sidewalks (red), only color red is shown. Another example: Foothill Expressway has shoulders uniformly 8 feet wide (grey), but where there is a parallel road, (blue), it would show only blue, not both grey and blue. The apparent logic, that walkers would use the parallel road, is not entirely valid because many parallel roads have no shoulders or sidewalks, and using the expressway shoulder would be safer than walking in the traffic lane of the parallel road. 2003 Plan, page 93 (excerpt paragraph). Note: This important portion from 2003 was completely eliminated in the 2009 update by County highway staff, who have fought against bicyclists and pedestrians use of shoulder and path for years. "landscaping needs to be kept trimmed back at intersection areas and along the travel way so pedestrians do not have to enter the travel lane.". Many of the same features that make the road safe for bicyclists apply also to pedestrians, such as minimum shoulder widths and no acceleration lanes. The separate bicycle section can be downloaded from the County's web site (then click "County Bicycle Guidelines"). Maps and the Plan can be downloaded from County's expressway website. For convenience, the main (all-expressway) pedestrian map is below. The most dramatic change compared with the 2003 map is that sidewalks are shown along San Tomas. County staff actually fought against sidewalks along San Tomas from 2005 until the 2008 draft, which was approved in 2009. [San Tomas] [Foothill] [Montague] [Lawrence] and two of these maps: [San Tomas] [Foothill]. Note regarding Lawrence map: Many shoulders of Lawrence were widened since 2003, so the map needs updating to show these shoulders as "wide". The 2009 plan contains routes (on expressway-specific pedestrian maps) and directional signage, where a closely parallel route exists. However, nothing has been done, to date, to create and post such signs. "Recommendations also include improved connections and directional signage to parallel pedestrian facilities, such as trails." How the draft changed from imposing more pedestrians prohibitions, to supporting pedestrians. 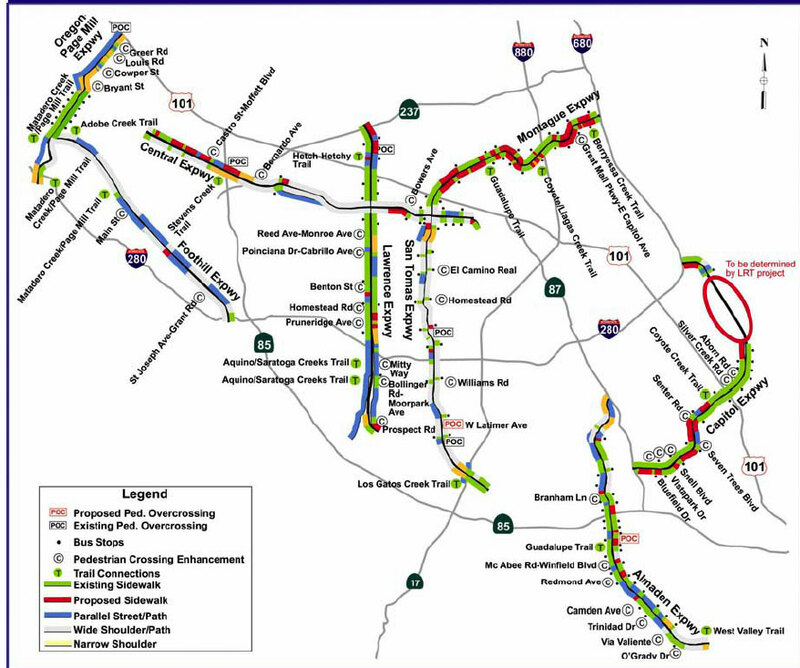 The VTA/County Bicycle-Pedestrian Advisory Committee [VTA BPAC] and MTS had significant input into the County Expressway Plan. The original draft of the County Expressway Plan (then called "Expressway Study") stated that pedestrians would be prohibited unless there is a sidewalk. This meant that pedestrian paths, shoulders and bike lanes would be newly prohibited to walkers, even where they have always been allowed, and with total disregard for their right to use roadways and the law. Attack on Pedestrians! Scare tactic, previously used against bicyclists, is now being used against pedestrians and transit patrons by the same highway engineers, in an attempt to take away their right to use the roadways. Result: BPAC voted that all prohibitory signs be removed. MTS requested changes to the Draft Pedestrian Facility Plan. Expressway Study: Rebuttal to the County highway engineers or see the abridged version. MTS also spoke to the Study's PAB and met with staff. Then, MTS had to go through the same fight all over again, from 2005 until the the draft Update to the Expressway Plan in 2008 (which added sidewalks along San Tomas and other locations). This was approved in 2009 by the Board of Supervisors. MTS successfully fought off County highway staff trying to prohibit pedestrians from most expressway miles during this period from 2005 to 2008, when County highway staff conducted a campaign to eliminate pedestrians from most expressway miles, by prohibiting all pedestrian path and shoulder use by pedestrians. Highway staff tried to take advantage of the secret change in State law that they wrote which enabled this to occur. The conclusion is that, as in the 2003 Plan, there are no pedestrian (or bicycle) prohibitions in the County Expressway Plan.